I'd buy a used Jeep Wrangler. They last forever and if you love to drive just for the sake of driving,are more fun than you can imagine. They're not for everyone, though. If you like to drive fast, don't get a Wrangler. They're quick (especially with manual transmission) and maneuverable in traffic but not built for open road speed. Great choice. You must have one. I have a 2005 Wrangler, manual, soft top. Bought it new in late 2004. More fun than you can imagine. Exactly. Top down in the summer. 4WD in the winter and I live in the snow belt. Plenty of power for a small vehicle. I have pulled numerous vehicles out of ditches and such with a tow chain. They almost drive like a sports car with the stick shift, and I know because I have owned a Miata and MG. True about not being built for open road speed. I would describe it as they "rumble" at high speed. I drove mine from PA to TX a few years back, and it didn't bother me all that much. It didn't bother you because Jeep people are cool. You had the cool factor so you didn't need the speed. I had a Spitfire and a Midget. The MG needed to be jumpstarted by rolling downhill everyday but it was a fun car. Like driving a toy. Those were the days when I didn't carry my life with me in my car. Oh, man, I miss those days. My first Jeep caught on fire and burned up. But I was on my second engine anyway. I bought a brand new Honda Accord, white leather interior, sunroof, British racing green. Beautiful car. Traded it in 6 months later for another Jeep. Oh yeah, about the cool. That's why Jeepers wave when they pass each other. I bet Audi owners don't wave to each other unless they are married. Code of the Jeeper. Gotta love it. One might think at first glance that jeepers, you can’t get much in those Jeep Wranglers. How about me and 4 teenage girls and all their sports bags and stuff on road trips, some of which were 2 hours away? Every road soccer and basketball game for 3 years. These teenage girls would argue about who got to ride with me. And it’s not because they thought I was cute. I would get a 2011 Honda Civic. They have gotten high reviews and are pretty good on gas. If you are a good negotiator or you go fleet, you can probably get a dependable and long lasting one for under $20k. You can't buy much with that amt. of money. 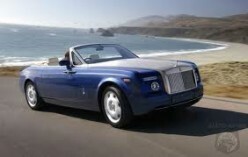 I can tell you are accustomed to commuting in a $500,000 Rolls Royce Drophead Coupe (see below). Are you looking for a chauffeur? Not hardly, I drive a 2012 Audi Roadster TTS, it’s a simple car, but cost $50,000 Plus and my Husband drives a 2011 Audi S5 Coupe, it’s a $53, 000 Plus car. When you buy new, you have a warranty, buy used, and you buy problems. We work hard for our money and I need something dependable. My husband's looks like this, same color, but convertible like mine. That's like Michelle Obama saying "You can't get much for $600. Maybe a pair of earrings." You go girl. New... but buying new is wasting money. Buy a $20,000 new car, and the minute you drive it off the lot you've lost $2,200. Drive it for 5 years, and it will be worth approximately $8,000. So you are essentially paying $3,600/year to drive a new car. Buy a 2000 honda accord for $4,000, drive it for 4 years, and you'll be able to sell it for ~$2,600. Even if you say you had to spend $2,000 on repairs, you're only paying $850/year to drive a used car. I would buy something 2000-2005 ish. Japanese, German, or Swedish. Buy the used car, spend a bit of money to replace all the hoses and belts, and pocket the $10,000-$15,000 difference. Hyundai Elantra -- great warranty of 50,000, so even a late model 2010-11 (I have a 2010) still has a nice warranty left and for pennies more, you could get a brand new one with back up camera, GPS and more. Great gas mileage (unlike that of any SUV) will help you be able to afford a top of the line model that feels just as luxurious as most luxury models. My daugher, whose last four cars were a Cadillac, a Mercedes and then two different BMW's is happier with her brand new Elantra than with any of the others. Upkeep is less and comes with 5 years of roadside assistance or in used, the balance of the warranty. Whatever kind of car you get, consider leather seats, which will keep your car looking new long after other people's cloth seats are dingy with dirt and helps with resale. Agreed. I did a lot of research and test driving, and I could have pretty much had any reasonably priced car I wanted. I chose the Elantra (which also has a really high safety rating), and I am very pleased with it. It even has a hook so I have somewhere to put my purse! It depends on what you want. If you're talking late model (or semi late) you can get a really nice, low mileage Honda S2000 for less than $20K and have enough left over for a reliable but not so pretty car for your daily driver. If it was me, I'd probably go for a late 60's - early 70's Mopar station wagon, freshen the interior, get it painted, and drop in a crate engine. Station wagons are cool and they're starting to have collector value. Oh yeah station wagons are too cool. Most fun vehicle I ever had was a 1957 Studebaker station wagon. Red and white. I mean I've had a MG, a Miata, Toyota trucks, a 65 Mustang convertible, a 61 Olds convertible, etc., etc., and now a Wrangler I love. So I paid $125 to drive this Studebaker station wagon off the lot. I had a flat tire about a hundred yards from the place and no spare. Well, I fixed that up and kept right on stationwagoning. What was fun about this vehicle was the oil consumption. You pull up to a light in a city and a huge black cloud erupted and the pedestrians crossing the street . . . well, they couldn't see too good, among other things. So the moral of the story is if you're going to spend a fortune, buy something that's too cool and fun. With $20k, I'd buy a 2003 model, Jaguar XK8 Convertible, Champagne in colour for $10k. I spend $5k overhauling Engine, Transmission, Suspension etc to ensure it would last another 20-30 years. This all depends on what you need from the car! If you're looking for something sporty and don't care about practicality, you can find a Honda S2000, Porsche Boxter, or Mazda Miata for that kind of money. Looking for sporty but need backseats? Look for a Subaru WRX/STi, Audi S4, or BMW 3/5 series. If you just need some transportation, go Asian. Newer Hyundais are surprisingly good, and you know that any Honda or Toyota will last FOREVER without anything beyond tires, brake pads, and oil changes. The choice would be Mercedes hatchback model to be launched in the market soon. At least I heard its gonna be around 20k$ and if not then the choice would be Honda Civic. The interior luxury features are astonishing. What I'm in love with is also its front grill. The curvy headlights are superb. With enough money the choice of a Mercedes hatchback model else the Civic is the one. I'm told that cars in the United States of America are much cheaper to buy than here in Australia. In Australia you can buy a new Mazda 3, Hyundai C30, or a Ford Focus for around $20,000. All of these are good little 2 litre cars with lot's of get up and go and with good fuel economy. Fuel is much more expensive here, too. The trend is Australia of late is a gradual move away from V8s and big sixes to smaller cars, although a lot if big, gas-guzzling 4WD are still being sold. If I have a budget of $20k I will go for a brand new Mustang...!! I would buy airfares to USA & buy a cheap campervan or car & tent to do Route 66 ! I would buy a Toyota FJ Cruiser. They look great, have excellent handling, and they are just all around awesome! 2004 SVT Cobra or 2003 Mach 1. Why? Because I love those cars. I would go with a four door Chevy or GMC full size pickup, leather interior and as many options as possible. I miss having a truck. What kind of car do you drive? What is your dream car?